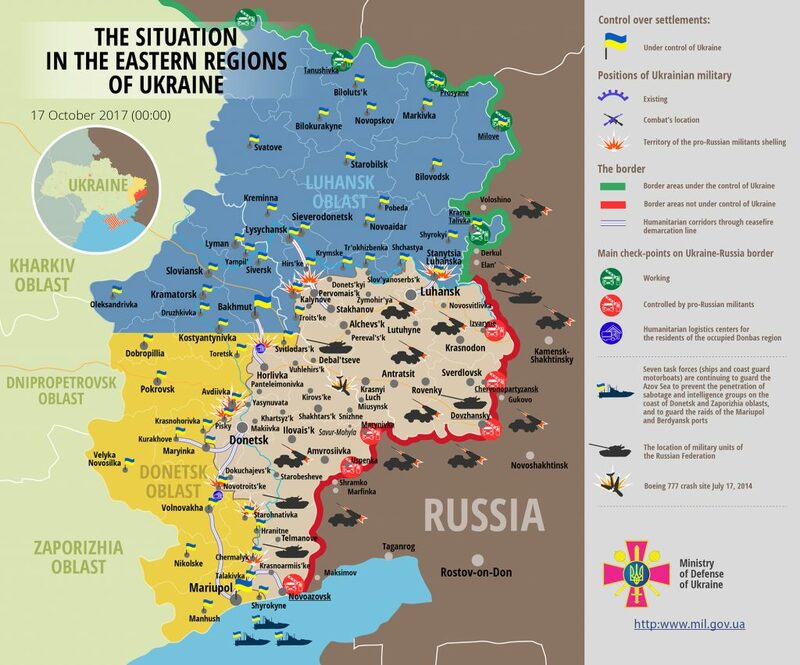 The operative situation escalated in ATO zone yesterday: Russian proxies increased both the number and the intensity of the attacks. In total, 36 hostile ceasefire violations took place in all sectors, reported Ukrainian Ministry of Defense spokesman on ATO Colonel Oleksandr Motuzyanyk at a press briefing at Ukraine Crisis Media Center. Ukrainian troops recorded 20 militants’ attacks in Donetsk sector, 11 – in Mariupol sector, and five in Luhansk sector. The situation was the most restless in Donetsk sector. Militants intensified their attacks in the afternoon. The largest number of armed provocations took place near Shakhta Butovka position, Kamianka, and Avdiivka. Militants attacked each of these places four times. The attacks continued from the beginning of the day till late night. For instance, Russian proxies used grenade launchers and machine guns against Shakhta Butovka position twice during a couple of hours. Ukrainian troops had to respond with the available weapons allowed under the Minsk agreements. In Artemove, Russian proxies used 82-mm mortars firing four rounds during the day. Later, militants attacked Ukrainian troops with infantry fighting vehicle in Zaitseve. Moreover, Russia-backed militants shelled residential quarters south of Zalizne with nine 82-mm mortar rounds, wounding a local inhabitant. “The woman was taken to the hospital and received medical help. Her condition is satisfactory,” informed Col.Motuzyanyk. In Luhansk sector, militants delivered intense small arms fire near Novooleksandrivka and Popasna. Russian proxies also used hand grenade launchers near Stanytsia Luhanska and Valuiske. Ukrainian troops responded with small arms fire. In Mariupol sector, militants shelled the vicinities of Vodiane with three 82-mm mortar rounds and fired six 120-mm mortar rounds at Pavlopil. Near Novotroitske, the enemy used IFV weapons and grenade launchers around midnight. “Ukrainian troops returned fire using organic weapons,” said the spokesman. Two Ukrainian troops were killed in action yesterday: one soldier was killed in a hostile attack near Kamianka, the other serviceman received fatal injuries as a result of tripping an IED near Nevelske. Two more Ukrainian servicemen were wounded in action: one near Pavlopil and the other near Shakhta Butovka position. “The casualties were evacuated to hospital and provided with proper medical care,” said the spokesman. Report on the military developments as of October 16 is available here. Interactive data on the shelling: chronology shelling chart and the interactive map.